Who doesn’t love coffee? Coffee is our best friend, the way to start and brighten our day! With this collection of coffee-inspired items, your favorite brew will not only kick start your day, it’s guaranteed to bring some guffaws along the way. Here we have the perfect coffee gift ideas for the coffee lovers you know, including yourself. These funny coffee gifts will surely bring a smile to everyone’s face and set them off to a good start. Enjoy your first cup of coffee in peace with this funny statement glass mug. While everybody knows it’s rude to disturb people before they finish their morning beverage, some people just don’t get it. This funny glass mug should do the trick. 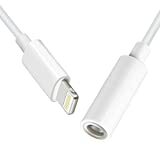 Grab it on Amazon & Save [parcenta asin=”B00V2BEIIG”]! This thermal mug lets you start your day on a quirky and funny note with its heat-induced mood transformation. The color changes from black to a bright and cheery yellow while you pour your favorite hot beverage into it. It also lets you know when it’s time to dump that cold drink and change it with a fresh serving. 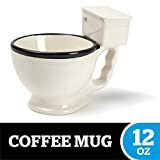 This poop shaped coffee mug is not your conventional coffee mug, but it has the power to make any coffee drinker smile with its cheeky statement. It looks disturbingly close to the real thing, but believe it or not, your coffee will taste just as great in it and you will get the same health rewards from your coffee as usual. Know any potty mouth who would love this big mouth toilet mug? This coffee mug looks so real, you might actually think twice about drinking your coffee from it. Have a good laugh with friends, colleagues, or family members and get them one, too. They’ll surely love their coffee even more! Have a coworker who’s saying goodbye to the corporate world for good? This funny coffee mug is a great gift for them to remember you. The imprinted design is done in premium full color and appears on both sides of the mug. Make coffee time even more enjoyable for your buddy with this funny coffee gift mug. Cat lovers will definitely swoon over this funny ceramic white cat-shaped coffee mug. The adorable coffee mug has cat ears to boot. 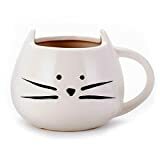 Cute and funky, you’ll enjoy drinking your favorite coffee, milk or tea while cuddling your cat-mug. 7. Laser Engraved “But First, Coffee” Stainless Steel Spoon by Sterling James Co. This stainless steel spoon is a reminder to everyone around that coffee comes before work, conversation, or email. Get this laser-engraved funny spoon for yourself, a friend, or a colleague that wouldn’t let his coffee take second place in his day. Because coffee always comes first. 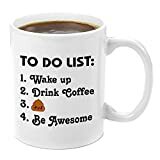 This cheeky to-do list on your coffee mug takes the cake as a great gift idea for colleagues, family members or friends who are masters of scheduling. An awesome way to let them know that you respect their order and organization skills. Hands down, this is the funniest and best gift that you can give your dad on Father’s Day! Get a good laugh with the whole family as you watch the man of the house savor his coffee from this premium 11 oz funny coffee mug. 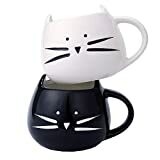 For your couple friends, these 2 pack funny cute little cat mugs are the perfect pair. They come in black and white ceramic, complete with adorable kitty ears and face. The mugs are wide and can hold 420 ml of liquid, and are perfect for your morning brew of coffee or tea, or milk, cereals, and hot chocolate. Another great gift idea for couples, this Mr. Right and Mrs. Always Right sums up the married life pretty well. These funny coffee mugs will surely bring a smile (or a smirk) on your friends’ faces and are the perfect engagement, wedding, or anniversary gift. 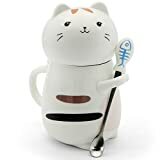 Cat people who are coffee enthusiasts will love this cat shaped ceramic mug that comes with a fish designed spoon. The cat’s cute expression, complete with small ears, feet, and tail as the handle will definitely win you over. The cat’s head serves as the mug’s cover and helps keep your beverage warmer for a longer period of time. This tall coffee mug looks innocent enough until you flip it to see what’s printed on the bottom. Drink your coffee intentionally in front of friends and colleagues to play the joke on them and you’re sure to elicit the giggles every time. This funny coffee mug will surely earn the thumbs up for being original. This big sassy mug is a great gift for your mom or dad, grandpa or grandma on their special day of the year. With a capacity of 15 ounces, this coffee mug will surely jolt you awake with all the coffee (or tea) that it can hold. This coffee mug is a great way to assert your place as the family favorite. 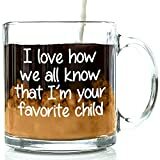 Sibling rivalry can take a funny turn when you get this glass coffee mug for mom or dad on their special day. The clear glass mug states the fact in a cheeky way, and is sure to elicit a chuckle or two from the family every time. Make any boss laugh with this naughty coffee mug. 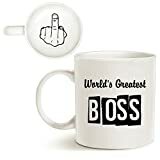 Printed with the World’s Greatest Boss on both sides of the handle, just drink a little and show the hidden message on the bottom of the mug. Make people around you laugh while you enjoy your favorite beverage in this ceramic coffee mug. If you’re the type who needs coffee to start your work, to function effectively, and to last through the day, then you will surely love this shirt. This funny statement tee shirt comes in four colors for men and women and makes a great gift for all your friends who can’t live without coffee. Whether you love an espresso, a latte, or a cappuccino, this Certified Barista shirt is for you. You’ll surely be inspired to whip up your favorite coffee drink in this statement tee. Spread the energy and get it as a gift for your friends and family members who’d love to be a 100% certified barista. Anyone whose heart beats for coffee will truly adore this shirt which features a coffee cup and heartbeat design. It comes in sizes for teens, men, and women in four different colors. You’ll surely find one that suits you, as well as a fellow coffee addict. Have a spooky coffin break with these Halloween gift ideas especially made for coffee lovers. These spooky yet funny coffee gifts baskets contain an assortment of shortbread cookies, Irish Creme coffee or creamer, dark chocolate bars, and an assortment of goods that are sure to be a hit with coffee enthusiasts, whether young or old. You can also get some accessories to add to these coffee gift baskets. There you have it, the list of funny coffee-inspired items for the bean lovers out there. Pick your favorite ones on this list and get them for yourself or your friends to give as funny coffee gifts on special occasions. They will surely love these cute collectibles and appreciate the thought that came with them. 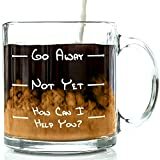 See More Funny Coffee Gifts On Amazon!